If you’re interested in exploring the latest MPK technologies and learning about whether they are appropriate for you, visit our prosthetic technology page and filter by “Microprocessor Knees”. At MCOP, our prosthetists are national and international leaders in microprocessor knee technologies. 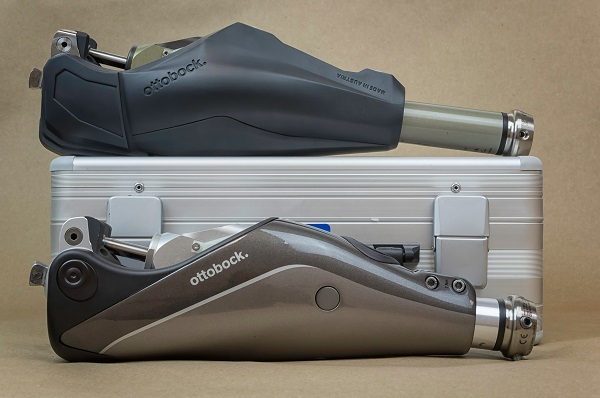 Over the years, we have consulted for top manufacturers like Ossur, Ottobock, and iWalk to assist in the development and advancement of prosthetic knees and feet technologies for amputees. Our prosthetists are experts at fitting and optimizing the latest bionic technologies and powered prosthetic knees for each amputee’s specific lifestyle and mobility goals. Because of our unique partnerships with the leading microprocessor knee companies, we are even sometimes able to offer our our customers early access to the latest and greatest technologies ahead of any other prosthetic company in the country. Amputees choose us for expert Microprocessor Knee care because of our experience and leadership with prosthetic technology. A few fast facts about MCOP’s unmatched experience with microprocessor knee technologies are below. We have the most experience of any private clinic in the world (measured by volume of purchases) of Ossur’s innovative Power Knee, the world’s first powered prosthetic knee. We have the most experience of any private clinic in the world (measured by volume of purchases) of the Otto Bock X3 and Genium microprocessor knees. Our team was also part of the initial testing & development of this technology at Walter Reed National Military Medical Center. Our prosthetists are certified in all of the leading technologies, including Ottobock C-Leg and Genium, Ossur Power Knee and RHEO KNEE 3 and XC, and more.